Sun, sand and cocktails, with stunning views and stellar service. Conde Nast put out their list of best beach bars and clubs in 2013, and these are some of our favorites. This is the VIP place to be in Ibiza. Frequented by the likes of Kate Moss and Leonardo di Caprio, expect the ultimate VIP treatment. Though the beach club has celebrity status, there are plenty of chairs to go around. The vibe is relaxed chic, with huge circular beds below the terrace, and comfy sunchairs on the waterfront. Impromptu fashion shows are common, the restaurant is fantastic, and once the sun goes down and the DJ gets started, the all-night parties are hard to beat. Chill by day, wild by night. Don’t miss Blue Marlin on your next trip to the White Isle. This place is funky and modern, bursting with color and style. The crescent shaped building maximizes ocean views and has a lounge area with day beds, an infinity pool, and a garden. There’s a casual and more upscale restaurant, both presenting fabulous dishes. International DJs perform regularly, keeping the place packed nightly. The lively vibe at Potato Head Beach Club is distinctly Indonesian, yet trendy. Bonus points for the cool shaped glasses the delicious, tropical drinks are served in. Petrol station turned world-class restaurant, Lone Star Barbados boasts celebrity clientele and luxury accommodation. It’s beach-shack cool meets effortless class. Blue, white and mahogany ooze serenity, while giant silver mirrors and waitresses in mechanic overalls add quirkiness. The local fish is always fresh and prepared perfectly, and the English ownership comes through with bangers and mash and shepherd’s pie. Unlike most beach clubs, Lone Star favors a steel band over DJs, and they play well into the night. Make sure to get a rum and sour -- the best on the island by far. Laid back and full of beauty, (the people and the view). That’s Rocka Beach Lounge and Restaurant, perched on a slope overlooking the white sand beach and crashing surf. The fresh ceviche, calamari, and plush daybeds are reason enough to make the trip, but weekly DJ parties under the stars will keep you there long into the night. Don’t worry, it’s worth the lack of sleep. A must-visit when in Rio de Janeiro. 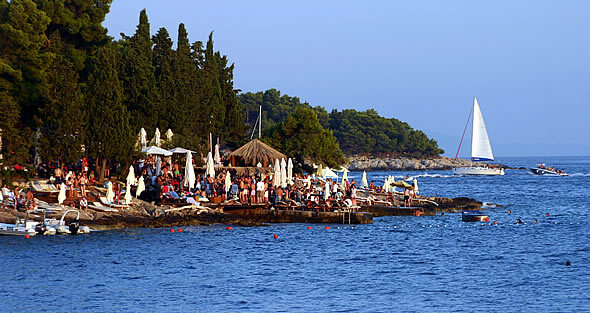 This Hawaiian themed club is a staple on Croatia’s party island. At night, a young, international crowd gathers to drink, dance and catch the best view of sunset on the island. Pitchers of Caiprioskas are surprisingly cheap, and the kebabs and satay skewers are addicting. Things can get rowdy, but if that’s not your style, the bar is much more calm by day, and sunning on the rocks looking gazing at cliffs and the sea is like something straight out of a travel magazine. (Fly into Split and take the ferry to Hvar). The most stylish shack in the world, La Plage attracts a hippy set with a taste for French cuisine. And they have good taste. The French food is by far the best in Goa, and the club is a colorful haven of muslin curtains and open air seating atop a huge white sand dune. The accompanying shop sells beautiful Kaftans, and the music ranges from jazz to hip-hop. Goa might be backpacker haven, but these are elite backpackers, and you better reserve in advance. The Hotel Saint Barth is practically dripping with celebrities. Madonna, Beyonce and Jay-Z are just a few of the famous regulars. Cocktail hour starts early, and the guacamole is to die for. Stunning villas with private pools overlooking the bay, the most accommodating staff you could ask for and a peaceful white-sand beach. The small paradise is so luxurious real life will be hard to return to. Nestled on Pampelone Beach, between St.. Tropez and Ramatuelle, Le Club 55 has been the “it” spot in the South of France since, well, 1955. Story has it that in that year, Bridget Bardot and Roger Vadim were filming “When God Created Woman” on the beach, and the Colmont family happened to own this beautiful cabana. The Colmont’s were asked to cater for the film crew, and boom, Le Club 55 was born. Today, the club typically serves 1000 patrons between noon and 6pm every day. Reservations are a must, and you can come by car with valet parking, or pull your boat up to the Club 55 launch. The people watching and artichokes are both incredible, as is the service and view from the beach.